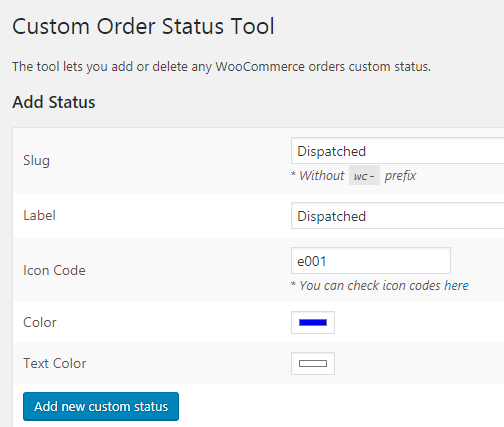 Now that your Custom Order Status for WooCommerce Pro plugin is installed & activated, you can start creating custom order statuses from the WooCommerce menu. 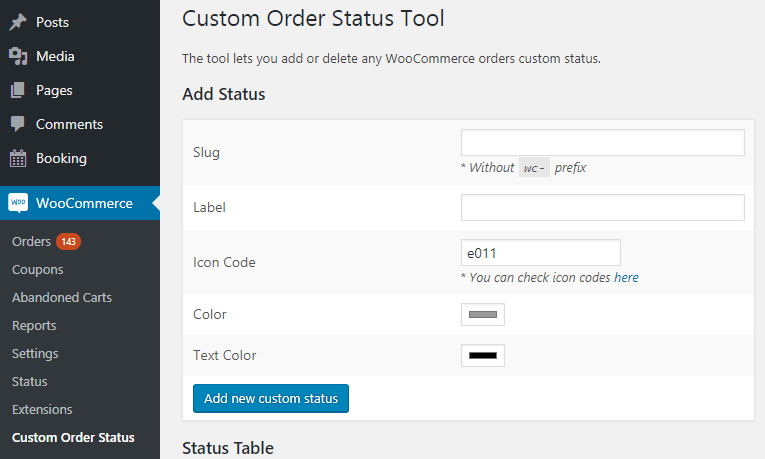 Click on Custom Order Status option and you will be taken to the Custom Order Status Tool page where you can Add, Edit and Delete custom order statuses. Let us understand these 3 options separately for better understanding. On Custom Order Status Tool page, you can add a new custom order status, add an icon for representing the order status and select appropriate color for distinguishing it from the other order statuses. 1. Slug: This is added to identify the status, which can be used in the custom code. Typically, it is recommended to add a slug that is a hyphenated version of your status label. Hence have added slug ‘Dispatched’, which will be used as ‘wc-dispatched’. 2. Label: This refers to the name given to the status which appears in the Orders list and on all order information. The label given to this status is ‘Dispatched’. 3. Icon Code: This allows you to select an appropriate icon for this status which will be displayed on the Orders page under Actions column if the Add custom statuses to admin order list action buttons setting is enabled. An icon is a graphical image that represents an application or a specific entity with a meaning. The code used to display this icon is called an icon code. You can get the icon code from the WooCommerce icons link provided. The icon code selected for Dispatched status is e001. 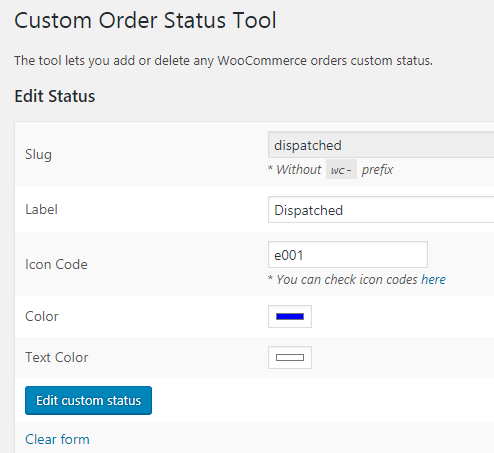 This means dispatched status will be displayed with the icon selected, under Actions column on Orders page. 5. Text Color: This color is used for the text of the status eg. Dispatched. The text color of the status selected is white and will be displayed under Status column on the Orders page as shown in the above image. As you can see, the Status Table already has a list of core WooCommerce statuses. The newly created custom order status ‘Dispatched’ is added to this list at the bottom. It also displays the icon code and colors selected for this status. Once after custom order statuses are created, you may need to edit them in future. For this, you can go to the list of statuses displayed under the Status Table and click on the Edit button of that particular status. You will be taken to its Edit Status section. Let us take the same example and understand the Edit option in detail. Now you can edit the details as per the requirements. You can also click on the Clear form option and add details for all the fields again. As we know, the icon is displayed on the Orders page under Actions column. So let us check the effect on the Actions column after editing the icon code. 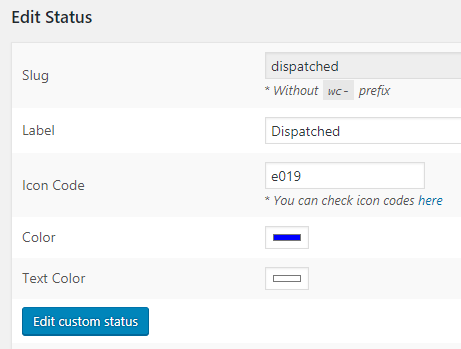 This shows that by editing the icon code, the Action icon for Dispatched status got changed on the Orders page. Thus you can use the Edit option to change the label, slug, icons and its colors as per your business requirements. Let us discuss these 2 options separately for better understanding. This shows 2 orders which had the status Dispatched were deleted because the Dispatched order status was deleted. If you wish to delete only status but not the orders associated with it, then select the Delete with fallback option instead. This is another option for deleting the custom order status. When you select Delete with fallback option, the status will get deleted and all the orders with the deleted status will change to the fallback status. Here fallback status refers to a status which the admin has added in the settings which takes effect when the custom status is deleted. Let us consider the above example and understand this option in detail. This shows that the Dispatched status was deleted successfully and the status of the orders which had Dispatched status were changed to Processing as the fallback delete order status is set to Processing under General settings. This will have effect on the Orders page in the backend as well as in the Orders section on the customer’s side. Thus the order status will show as Processing instead of Dispatched on the customer side.